The alearning Blog is the brainchild of Ellen Behrens, who has been working in online education for seven years, association learning for more than a couple, and adult learning for more than twenty years. After working for a Web company that developed learning management systems and created custom elearning for corporate clients, Ellen escaped to the non-profit world where she led her trade association into online learning. Under her guidance, the association was able to offer its first asynchronous Web-delivered course, and its first synchronous Webinar. Along the way, she kept looking for a group that brought together other association learning executives to share lessons learned, challenges and solutions. In addition to the corporate-focused conferences, publications, and Web sites she was already familiar with, she found a few more but those were directed to government and higher education. No one seemed to be addressing the unique needs of non-profit trade associations. When her phone began to ring and e-mails started to find her looking for help with associations heading into online learning, she decided to create ways to share what she’s learned. 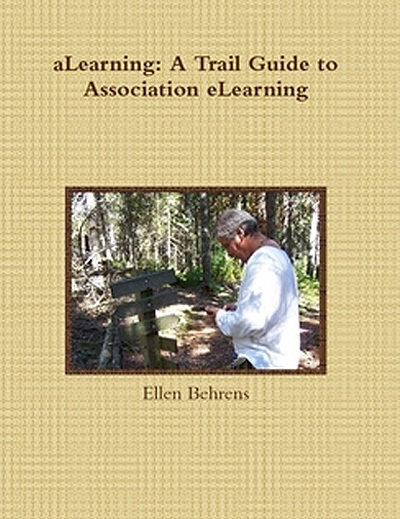 aLearning stands for Association Learning. Association eLearning to be exact.